An earthquake jolted parts of Pakistan and Afghanistan in the early hours of Tuesday, spreading fear and panic among the populace. According to European seismological centre here, the intensity of the quake was recorded as 5.6 on the Richter scale and its epicenter was the Himalayan mountain range. The tremors were felt in Peshawar, Malakand, Swat, Upper and Lower Dir, Murree, Gilgit, Abbottabad, Nowshera, Haripur, Hazara, Lahore and the federal capital among other parts of the country where residents evacuated homes and buildings out of fear. No casualty or damages, however, reported from any part of the country. The earthquake tremors were also felt in the border areas of Afghanistan. A 7.7-magnitude earthquake had struck Balochistan, killing over 370 people in September, 2013. Northern areas of the country were also hit by a 7.6-magnitude earthquake in 2005 that killed more than 73,000 people leaving more than 3.5 million homeless. 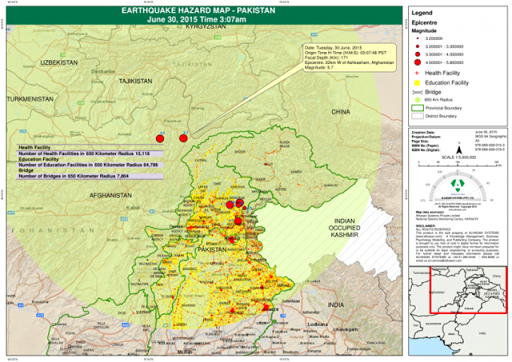 An earthquake with magnitude 5.5 occurred near Feyzabad, Afghanistan at 22:07:48.00 UTC on Jun 29, 2015.